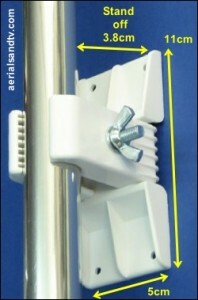 ﻿ Sales of Aerial, Satellite and Weather Station Brackets & Clamps. All our brackets are best quality welded and hot dipped galvanised (to BS EN ISO 1461) and come with a lifetime warranty. 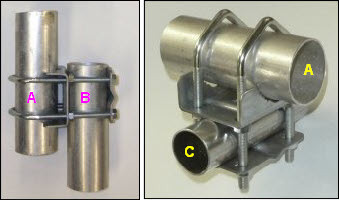 See summary of which bracket to use with which pole/aerial. All our T & K brackets are best quality welded and hot dipped galvanised (to BS EN ISO 1461), they all come with a lifetime warranty. T & K brackets come as a pair. 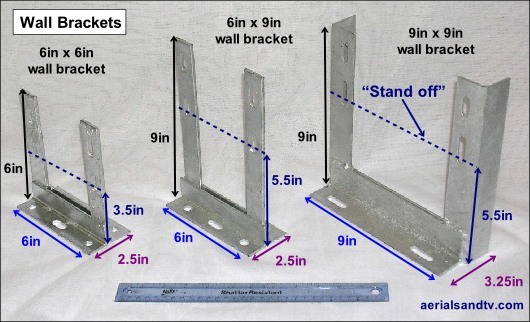 All our brackets are best quality welded and hot dipped galvanised (to BS EN ISO 1461). Finish may vary. 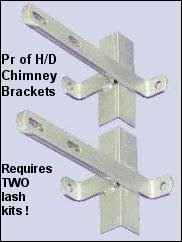 The 6” bracket and the mitre bracket require one lashing kit, the H/D pair requires two. The 6" bracket requires modifying if it is to accept 2" V bolts. 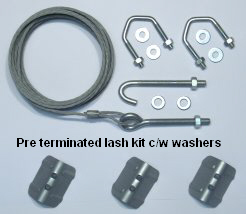 Our chimney lash kits have one end “Pre Terminated” for an easier and more reliable install. The kit comes with 2 x 1.5” V bolts. Note that 2” poles require 2” V Bolts ! Corner pieces, Eye bolts and J bolts are all available separately, please phone for this. 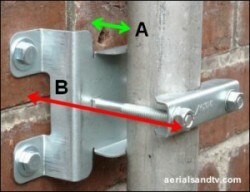 See summary of which bracket to use with which pole/aerial and bracket dimensions. All our brackets come with a lifetime warranty. A pair of V bolts & 4 wall anchors are required per bracket and are NOT INCLUDED ! Note : the H/D brackets are supplied with a pair of 2.0” V bolts. Double clamp assembly handy for temporarily attaching an aerial pole to another vertical tube, most often used to bolt a pole to a caravan jockey wheel, for which two are usually required. 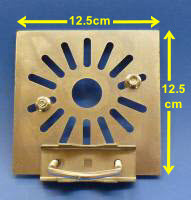 The bar is 20mm square section alloy 28cm long. The M6 clamps are plated steel and fit poles up to 2" in diameter. Clamp to hold a 1” pole, e.g the caravan pole. The clamp can be temporarily attached using the (included) adhesive pads, or permanently bolted, screwed or riveted on. 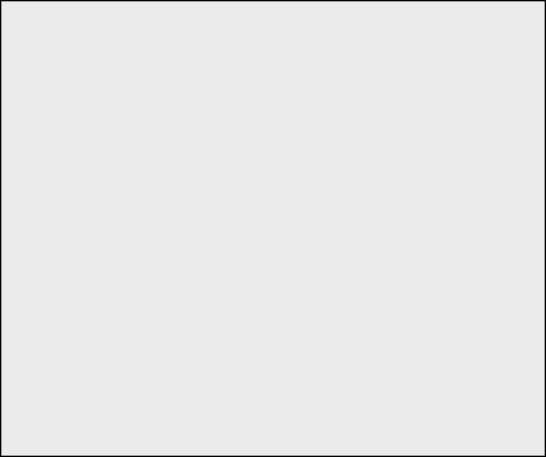 The clamp is supplied singly, though they are often used in pairs or even three of. The base and jaws of the clamp are made of (reasonably strong) plastic. you phone the order through ! This Die Cast M6 Wing Nut is the best compromise between the strength of a nut and the convenience (for boat and caravan aerials) of a wing nut. Integral 10mm hexagon for use with a spanner if required. Non rust Zinc alloy. Can be used with the loft kits or through brackets etc etc. The Ts and Ks are also available separately. See article on use of two Ks. 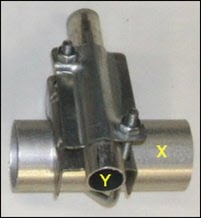 Two wall anchors are required for each T, and three for each K. V bolt is not included. P&P is cheaper for this item if you phone the order through ! 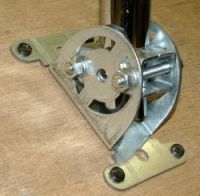 Neat way to attach a short 1” diameter pole to a wall or post, particularly suitable for caravans, boats and sheds etc. Includes the 1” M6 U bolt. Zinc plated * steel 1.5mm thick. 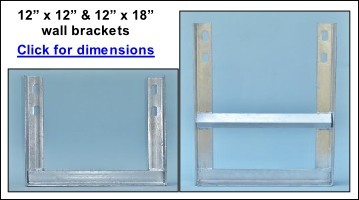 The 3ft and 6ft x 1” poles, the caravan poles and the 36” x 1” L section poles fit this bracket. * Zinc plating isn`t the best anti corrosion coating (particularly on nuts and bolts) but the plating on these brackets is actually pretty good. We have one on test which hasn`t rusted at all (even on the edges) after 4 years. 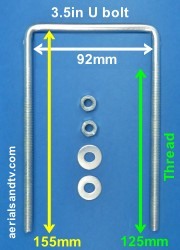 Our lash kits and V bolts are supplied with washers (zinc plated). This is at a great deal of trouble to us I may add, because no supplier includes the washers with the V bolts, or with any (pre-terminated) lashing kits. We have to source the two different sizes of washer and then put them all on ! Note, when using “V bolts” to attach the pole to the bracket care should taken not to over tighten the top one. This is to avoid weakening the mast by crushing it, though the latter is less likely with a 16G pole. The bottom V bolt can be tightened as much as you want to ensure that the pole/aerial doesn`t slip round. 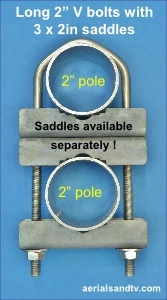 This is particularly important with a big aerial or a cranked pole, also see use of V bolts with saddles. See our our pole lifetime warranty and bracket lifetime warranty. Low Profile Wall Bracket Designed for use when maximum neatness and/or minimal stand off is required. More clearance can be achieved with a cranked pole. Generally used in pairs (unless it`s a small aerial on a short pole, 3ft or less). Comes with the sledge and bolts so no separate V bolts are required. 1.5mm steel pressings. 2 - Hot dip galv (finish may vary) with stainless bolts. The 6x6 bracket requires modifying if it is to accept 2" V bolts. See V bolts rust first ! Highest quality V bolts, nuts & washers in A4 / 316 (marine grade) stainless steel. The 1.5in Vs are M8 thread and the 2.0in are M10. 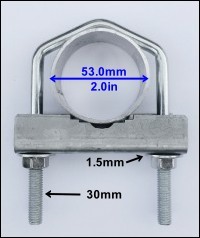 NOTE : the stainless 2” V bolts we sell are longer (approx 11mm) than our plated ones. 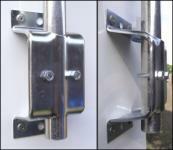 The stainless 1.5” V bolts fit the same size poles as the plated, they`re just a different shape ! 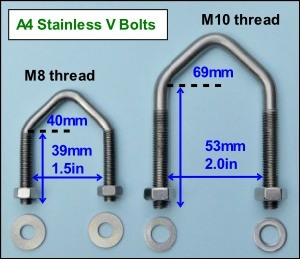 2.0 inch V bolt (extended leg) - M10 thread - in A4 (marine grade) stainless steel, c/w sledge and washers. The V bolt and washers are stainless and the sledge is hot dip galv (not inferior pre-galv) steel (finish may vary). The 2.0in sledges are also available separately. 2.0mm zinc plated steel (finish may vary). Clamp accepts a pole between 1 and 1.5 inches. The slots are 6.5mm x 26mm. c/w 2 plated set screws M6 x 20mm with serrated flange nuts. Very handy when needing to install a (short) pole at an angle. Accepts a 1 inch pole. Bracket is 2mm pre galv steel and M6 bolts are zinc plated, (though the supplied washers are stainless steel ! ). This clamp is also available with Nyloc nuts. These V bolts are also available with Nyloc nuts. Heavy Duty 3.5" clamp kit. The 3.5" clamp will accept poles from 1.25" up to 3.5" but will only clamp parallel, not perpendicular. 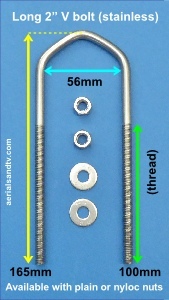 M10 threaded bar / studding. A2 / 304 Stainless Strength is midway between mild steel and high tensile. Being stainless it can be cut to length without increased risk of corrosion. Stainless steel fastener pack. 8 x M10 nuts & 8 x M10 Form A washers. This fastener pack is also available with Nyloc nuts. you do not have to have a PayPal account ! Or you can phone your order through. Supplied singley, i.e. not as a pair ! 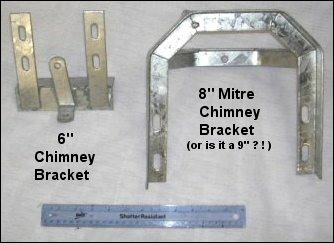 Note : because of the thickness of the H/D chimney brackets saddles cannot be used with 2 inch poles, unless using the (longer) stainless V bolts. 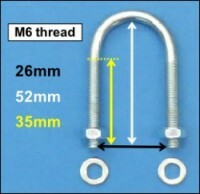 2.5 inch V bolt (long leg) - M8 thread - [one off] c/w sledge and washers. The V bolt and washers are zinc plated and the sledge is Pre-galv steel. Can also be used to mount a Mk 4 Sky / Freesat dish to a pole. The 2.5in sledges are also available separately. These low profile brackets are also available with Nyloc nuts. Heavy Duty 2.0" & 2.5" clamp kits. 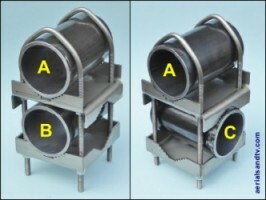 The clamps will accept poles from 1" up to 2.0” (53mm) or 2.5” (62mm) in diameter. A4 marine grade stainless steel M8 wing nut. 2.5mm steel, hot dip galv (not inferior pre-galv). Supplied individually. Holes take an M10 bolt. Supplied individually. The slots will take a 10mm bolt. These clamps are available in three finishes of varying corrosion resistance. For outside use we recommend Type 2, or for marine applications Type 3. 1 - Pre galv pressings and plated bolts. 2 - Hot dip galv pressings and stainless (A4/316 marine grade) bolts. 3 - Stainless (A4/316 marine grade) pressings and bolts. * 1.25 inch will go but is a very tight fit. This clamp is also available with Nyloc nuts (4 of 8). NOTE : Nylocs are unsuitable if this clamp is to be used for two 2” poles. But, for example, a 2” and a 1.5” is fine. * 1.5 inch will go but is a tight fit. Will only clamp perpendicular. Steel 2mm thick (av) / M8 thread. Unfortunately this clamp is only available with Pre galv pressings and zinc plated bolts, however the 2x2 clamp is available in other finishes. 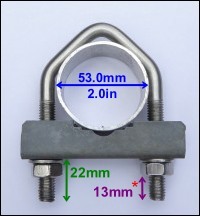 Our M8 stainless wing nuts fit these clamps (and many others). Hot dip galv pressings and stainless (A4/316 marine grade) bolts. Will clamp perpendicular or parallel. The steel is 3.0mm thick (av) and the bolts are M8 thread. This clamp is also available with 4 (of 8) Nyloc nuts. Heavy Duty 4.0" clamp kit. The 4.0" clamp will accept poles from 1.25" up to 4.0" but will only clamp parallel, not perpendicular. The above lash kit is also available without the 1.5” V bolts, this is primarily for those who actually need 2” V bolts or who want to upgrade to stainless or Nyloc Vs etc. The standard lash wire is 5m long, but if your chimney is bigger than this we sell a 10m length of the galvanised lashing wire, note this is only the wire, it does not include the J bolts/corner pieces. Do not confuse this with catenary wire (or similar), 7 strand lash wire is approximately 3.7mm in diameter and weighs about 65g per metre. See tightening a long lash wire. Also see stainless V bolts and V bolts rust first ! 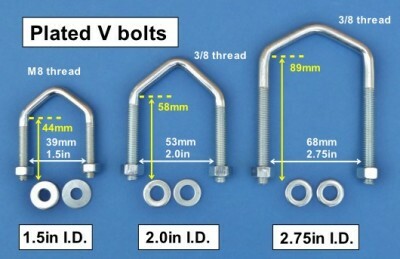 All our V bolts are sold in pairs and come with washers. Note that two V bolts are usually required for most brackets (1 pair of T&Ks requires 1 pair of Vs). 1.5" Vs are M8 thread. This is a very adaptable product because our 3.5in sledges (available separately) fit, so it can be used in a large variety of ways, see above photo. 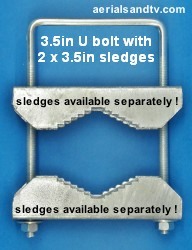 Can be used as a 3”V bolt ( or 3.5” V bolt) with the addition of a 3.5” sledge. if you phone the order through ! A pair of V bolts & 5 (or more) wall anchors are required per bracket. THESE ARE NOT INCLUDED ! This is a very adaptable product because our 2.0in sledges (available separately in hot dip galv or stainless) fit, so it can be used in a large variety of ways, see photo. 1.5 to 2.0 inch lightweight saddle / sledge. 1.5mm Pre Galv steel. Supplied individually. NOTE : if using 1.5in V bolts this sledge is only suitable for 1.25in poles (or smaller). A2 / 304 marine grade stainless steel. A pair of V bolts & at least 4 wall anchors are required per bracket and these are NOT INCLUDED ! T&Ks (or K&Ks ! ) are the strongest brackets, provided the spacing is adequate. Whilst we don`t stock these we do sell a 3.5” U bolt which can be used in place of either a 3” or 3.5” V bolt / U bolt when used with a 3.5” saddle. Available singly at £6.50 each, please phone for this. Available singly at £6.75 each, please phone for this. Finish 2 - Hot dip galv pressings (finish may vary) with stainless bolts. Available singly at £10.25 each, please phone for this. Available singly at £10.50 each, please phone for this. 2.0 inch saddle / sledge. 2.5mm steel, hot dip galv (not inferior pre-galv) finish may vary. Supplied individually. The slots will take a 6mm bolt, the holes will take a 10mm bolt. 2.0 inch stainless steel saddle / sledge. 2.9mm A4 marine grade stainless steel. 2.5 inch saddle / sledge. 2.5mm steel, hot dip galv (not inferior pre-galv) finish may vary. These sledges fit the 2.75” V bolts. The 3.0” sledges are a good fit for these V bolts.